I hope my Twitter friend @lambandflag doesn't mind me using his excellent pic of a mk1 Metrobus! This is preserved 6835 - one of 5 prototypes that led to over a 1000 of the type being built locally by Metro-Cammell for the West Midlands. I'll never forget the first time I ever saw one - parked up in Stourbridge garage. The front of the garage doubled as a mini bus station - imagine the Health & Safety concerns of doing that now! It looked very futuristic at the time, and - by golly - it had "coach" type seats which looked a million more times comfortable than the red practical but very boring red vinyl seating that adorned the Daimler Fleetlines - my usual mode of transport to school! Harts Hill garage had some Metrobuses - and they became regular performers on my school route. Of course, that only added to my growing interest in public transport! 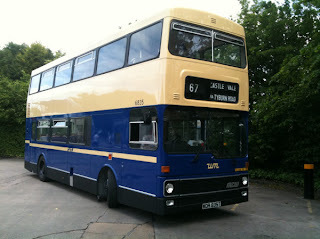 Mk2 versions later appeared, but I didn't like them so much - good buses that they were. And it was only last year that the final mk2 was finally withdrawn from regular West Midlands service. So when this pic of 6835 popped up on my Twitter this evening - looking resplendent in it's home at the Wythall bus museum - it brought back a whole load of memories! She's gorgeous! I wonder if some of NXWM's current fleet will make preservation? The state of some vehicles is appalling and the Tridents/ALX400's purchased 10 years look long in the tooth - the condition of the bodies on unrepainted examples looks particularly shocking. NXWM and its predecessors managed to get 25 years service out of each Metrobus - some of the modern fleet will be lucky to make 15.